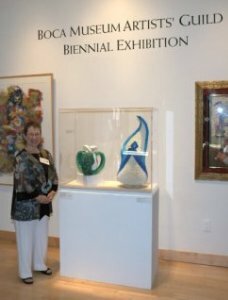 Francene J. Levinson, is a recipient of a "Featured Artist Award" from Manhattan Arts International, 2013, for her sculpture "Anemone". This piece is included in "Celebrate The Healing Power of ART" juried exhibition. Her direct sculptures may have as many as 6,500 pieces of hand cut, hand folded, archival color paper, bonded with Ph neutral glue. Levinson was born in Brooklyn, New York. She received her BA Fine Art and MA Art Ed at Brooklyn College, New York, NY. There, she studied with Ad Reinhardt, Philip Pearlstein and Albert Terris. She also studied stone carving at Montoya Studios, Palm Beach, FL. These skills are the foundation of her new paper medium. She was deeply inspired by this beautiful folk art created by the desperate Chinese immigrants taken prisoner off the ship, “The Golden Venture,” in 1993 in New York Harbor. The artist’s paper sculptures have been exhibited at The Scripps Research Center, in Jupiter, FL; and have been juried into many national and international gallery and museum exhibitions including: Boca Raton Museum of Art, Boca Raton, FL; Fuller Craft Museum, Brockton, MA; Art Rom Gallery, Rome, Italy; and Saatchionline.com, sculpture collection, Juror: Rebecca Wilson, Director, Saatchi Gallery, London, UK; and more. 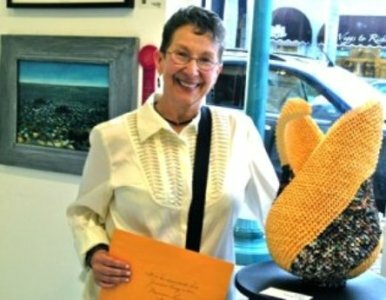 Her many art awards include: the Mastermind Art Grant for South Florida; First Place Award at the Boca Raton Museum of Art; Best in Show at Delray Beach “On the Avenue”; The Art Craft Award for Sculpture, Rosen Gallery; Best in Show plus People’s Choice at Rossetti Fine Art Gallery, Pompano, FL; among others. Her paper sculptures are represented by Paseo Originals Art Gallery, Oklahoma City. OK. The artist currently resides in Boca Raton, Florida.